Year 12 students expanded their cooking repertoire, hitting St Patrick’s Technical College’s commercial kitchen to make sausage rolls. As part of their Health students, the students made two types of sausage rolls – chicken and vegetable and traditional. Teacher Nicola Swiderski said the goal of the cooking day was to provide the students, who hope to become apprentices soon, with some different healthy lunch choices. “These young people will rely on taking packed lunches to work, especially if they are working away on job sites,’’ Ms Swiderski said. Ms Swiderski said while the humble sandwich was still a firm favourite in Aussie lunch boxes, she hoped the cooking class would expand the diet of the students. Student Herbertia Barber-Watts said she had enjoyed the cooking class and would be making the sausage rolls again. 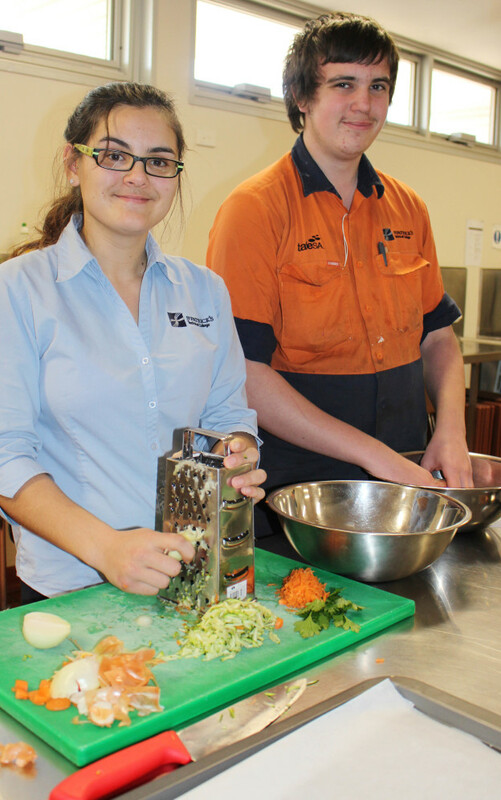 Pictured are Engineering students Herbertia and Jack during their cooking class. This entry was posted in Latest News on 21/06/2018 by St Patrick's Technical College.